The SparkFun International Kit (SIK) is a great way to get started with programming and hardware interaction with the Arduino programming language. The SIK includes everything you need to complete 16 circuits that will teach you how to read sensors, display information on an LCD, drive motors, and more. 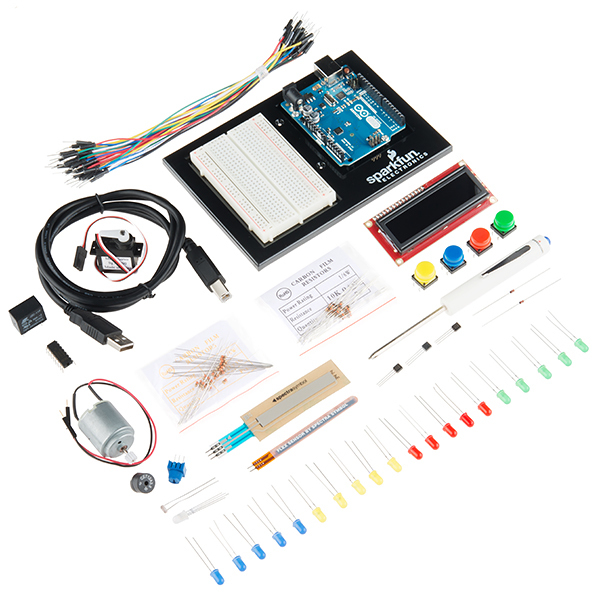 You don't need any previous programming or electronics experience to use this kit. The full-color SIK Guidebook (in the Documents section below) contains step by step instructions of how to connect each circuit with the included parts. Full example code is provided and explained and even includes troubleshooting tips if something goes wrong. The kit does not require any soldering and is recommended for beginners ages 10 and up. This International version includes the new Simon Says circuit experiment found in the V3.2 SIK with all the LEDs and tactile buttons you will need to complete it, the kit also replaces the SparkFun RedBoard for the tried and true Arduino Uno and removes the SIK Guidebook and carrying case. With these parts being swapped and removed we were able to reduce the overall size and weight of the kit making shipping cheaper and easier for anyone ordering it internationally.